My jaw dropped when I recently stumbled across the headline “Cards Against Humanity for Her Is the Same Game, but the Box is Pink and it costs $5 more.” Seriously? It. Is. 2017. Can we please, with cherries on top, put the Pink Tax behind us and move on to more important things (healthcare, global warming, maybe the whales)? Turns out, that’s exactly the point that Cards Against Humanity, a fill in the blank card game, is trying to make: unnecessarily deeming products “for her” is downright silly. In a satirical press release, the company announced they’d found a remedy for the age-old problem of what a woman is to do “when the men retire to the parlor to discuss the economy and various issues of the day.” Cards of Humanity “decided that hey, it’s 2017, it’s time for women to have a spot at the table, and nevertheless, she persisted. That’s why (they) made Cards Against Humanity for Her. It’s trendy, stylish, and easy to understand. And it’s pink. 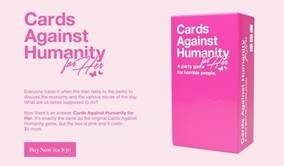 Women love the color pink.” The release goes on to include user quotes ranging from “Cards Against Humanity for Her makes me feel like my type of beautiful” and notes that the game is always “there for you when you need a good cry,” mocking additional benefits that are often listed on “female” packaging. The cards are already sold out and all profits were donated to Emily’s List, a political action committee that serves to elect pro-choice women into office. Twitter even got on board with the joke. Aside from being laugh-out-loud funny, this campaign forces consumers and online viewers to confront the absurdity that often stems from product development “for women.” More often than not, gendered products backfire by highlighting the utter unnecessity of “for him” and “for her” products – does the world really need men’s trail mix and girly girl binoculars? Props to Cards Against Humanity for not only being my favorite card game but also cleverly calling out a really important #marketingfail. Here’s to hoping other companies follow suit and that this starts a conversation about a very real issue.